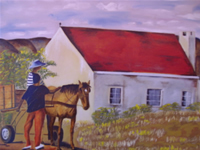 Yolande grew up on a farm in the Klein Karoo. She now lives near Mossel Bay with her husband, son and animals: horses, ponies, cattle and other pets. 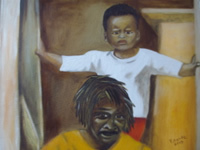 She likes to paint scenes from her everyday life, which includes portraits, landscapes, still life, pet portraits etc.